As the past few years have shown, piracy isn't just fodder for adventures stories featuring buccaneers with cutlasses and parrots cruising the high seas for plunder. The modern equivalent of this criminal enterprise is a grim, troubling reality as even a small group of armed men can take advantage of the isolation of the vast ocean to seize prisoners and make demands. One of the most infamous recent examples of this practice will come to the screen later this year with Paul Greengrass' Captain Phillips. 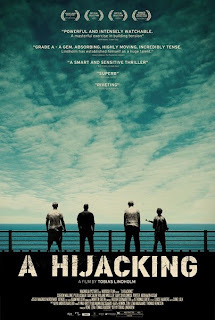 Until then, A Hijacking offers a different take on such a situation, although one that may divide audiences depending on what they're looking for. Foreign films often have a different energy and pace than American productions and that's certainly the case with this Danish import, which rejects opportunities to provide manufactured melodrama or action. 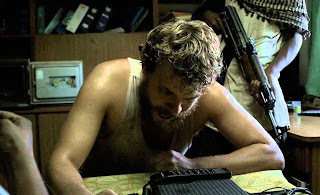 Instead, we're offered a stripped-down procedural emphasizing the wearying tension and psychological anguish faced by the crew of a cargo ship and their corporate masters at home when the boat is seized by Somali terrorists. The incident is viewed entirely from the perspective of two men at opposite ends of the shipping trade's power structure. Mikkel Hartmann (Pilou Asbæk) is the cook on the cargo ship MV Rozen, looking forward to the boat making port so he can get home to his wife and child. Peter Ludvigsen (Soren Malling) is the vice-president of the shipping firm, a high-powered executive who prizes efficiency and isn't reluctant to take charge if affairs aren't being conducted to his satisfaction. These two men, who have likely never met, are thrown into a desperate situation when a band of Somali pirates seize control of the Rozen and demand millions of dollars. Being a cook, Hartmann is among the few crew members considered essential and is separated from the other hostages to prepare meals for his captors. He is also selected to speak to his corporate superiors and relate the pirates' terms. Back in Copenhagen, Ludvigsen is advised to hire a professional negotiator to manage the situation but insists on dealing with the pirates himself, entering a tense waiting game with stakes far beyond his usual deal-making, where the slightest miscommunication and misjudgment can lead to loss of life. As the days of strain turn into weeks, both men near their emotional breaking point. One of the most interesting things about A Hijacking is what it turns out not to be. The trailers would make it seem to be a condemnation of corporate greed, where arrogant executives will allow their employees to remain in danger rather than pay up and threaten the bottom line. 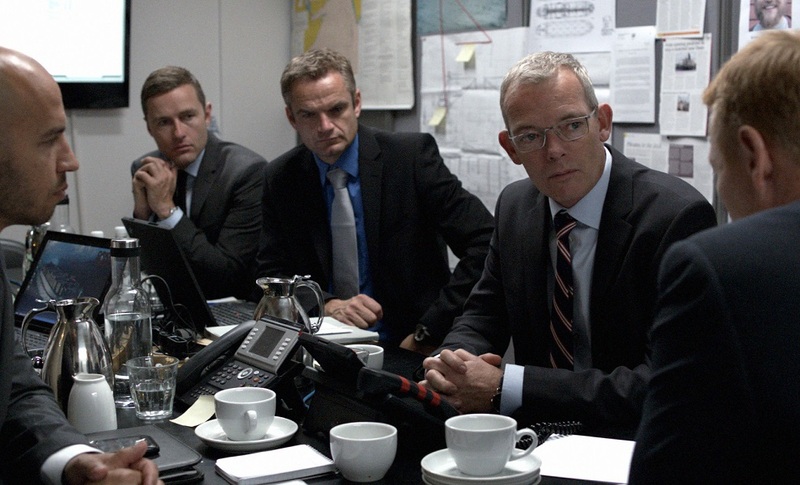 The reality is far different and writer/director Tobias Lindholm paints the event in much more complex shading. Ludvigsen's adviser warns him that agreeing to the kidnappers' demands up front will only prolong the situation as they would be encouraged to demand more and so Ludvigsen must low-ball them until his offers and the pirates' demand sync up. When he insists on handling the negotiations personally, the film is pleasantly ambiguous as to exactly what we should make of the decision. We have already seen him sternly telling one of his underlings that he should have been brought in sooner when a previous business negotiation seemed to be getting bogged down, suggesting a tendency to micromanage along with a reluctance to relinquish control. However, there's also a hint of personal responsibility. "It's my ship, it's my crew," he insists and makes it a point to face the families of the hostages himself rather than hide behind a company spokesman. Malling does fine work letting us see Ludvigsen's cold facade of detachment slowly begin to slip as the days drag on and his men are continually threatened. His stonewalling strategy puts added pressure on Hartmann, who is commanded at gunpoint to convince the company to acquiesce even as Ludvigsen is advised to only communicate with the pirates themselves. Asbæk, who looks like a Danish mix of Ewan McGregor and Michael Shannon, has a really tough job since he must by necessity play an almost totally reactive character, displaying the damaging effects of the high stress he's forced to endure at all times. He's constantly being yelled in a language he doesn't understand by men brandishing weapons, and remains uncertain about what's happened to the rest of the crew or if any second he might be taken out on deck and shot. We watch this humble man swing from enjoying desperate moments of humor with his captors to lapsing into traumatized catatonia. The third man in the conflict is the one between them, the Somali negotiator Omar (Abdihakin Asgar). He also remains shrouded in ambiguity, as he protests when both Hartmann and Ludvigsen imply he is allied with the pirates, making us unclear as to whether he's a man in denial about his criminal occupation, an outside contractor like Ludvigsen's adviser, or even a prisoner of the pirates himself. He's often civil and calming when dealing with Hartmann, and expresses a similar desire to just go home and be reunited with his family, suggesting he regards the whole incident as simply a business transaction that he, much like Ludvigsen, would rather have done quickly and efficiently. At the same time, that calm exterior can be turn downright chilling when he suddenly changes gears and terrorizes Hartmann in an effort to expedite the ransom process. 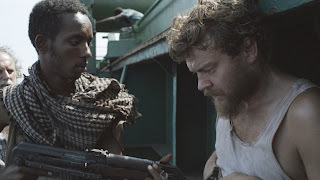 It's a strength of the film that as contemptible as their actions are, the film doesn't turn the pirates into cardboard heavies but humanizes them while not overlooking their crime. There's a wonderfully paradoxical scene when Hartmann and a fellow hostage are allowed on deck and start fishing that becomes a strange moment of bonding between them and their captors as everybody becomes emotionally involved in the effort. At the same time, we're always aware that the situation can turn in an instant and that no matter what the mood of the individual scene, the prisoners are always in mortal danger. 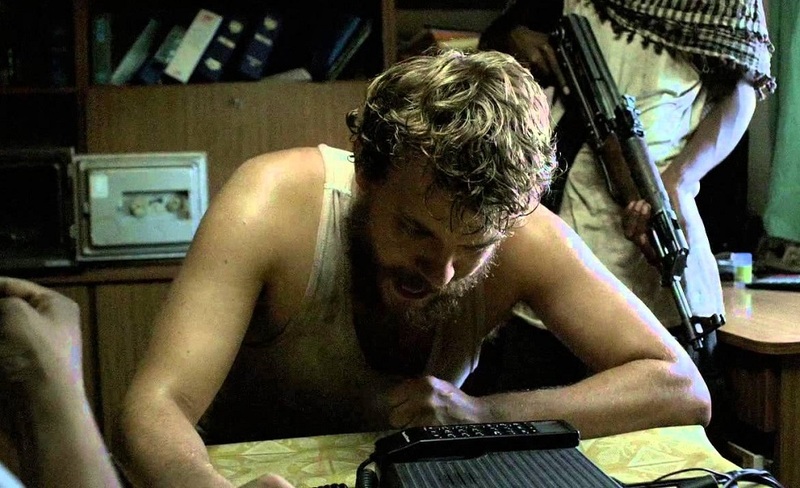 Lindholm does a great job ratcheting up the tension without relying on graphic violence or histrionics. The film becomes as much a test of endurance for the viewers as it does for the lead characters. The understated tone and pacing leave us constantly waiting for some kind of release, but real life doesn't always build to a cathartic action scene. There's no hope of some John McClane emerging from the crew to take on the pirates singlehandedly and the idea of the authorities sweeping in and handling the emergency never even seems to be a possibility. Instead, A Hijacking suggests that sometimes the kind of heroic traits most useful in the real world are patience, calm, and fortitude, that keeping your head down and quietly standing your ground can be more effective than raging against the forces of evil. For this reason, it may not be the most dynamic thriller you'll see this year, but it is perhaps the most honest.